Here’s one Mustang that’s certainly worthy of special honors. This custom s550 is a new limited-edition model made by Roush and Military Autosource that will be offered exclusively to U.S. Military through overseas dealerships. Dubbed the 2015 Roush Warrior Mustang, the car will be offered in either the 2.3 liter EcoBoost or the ROUSH supercharged 5.0 liter 627 horsepower Mustang package, as highlighted in The Mustang News. The custom s550 is available in Black or Race Red and features special Warrior badging as well as a custom Roush front fascia, hood scoop, and rear spoiler, among other custom touches. Inside, you’ll find a number of unique Roush features like a custom shift ball and embroidered logo head rests. Pricing starts at roughly $41,300 for the EcoBoost and $57,500 for the 627 horsepower ROUSH charged 5.0, which I’m betting will be the biggest hit among U.S. servicemen. In 2015 Roush and Military AutoSource—a company that helps military members overseas buy cars—teamed up to create the Warrior Mustang. The special Mustang boasted 627 horsepower and a host of other upgrades. Roush and Military AutoSource are back at it again, only this time there’s more power! The 2016 Warrior Mustang has 670 horses under its hood thanks to a 2.3-liter TVS2300 supercharger. The GT Performance Package is also included. It features a larger radiator, an upsized rear sway bar, bigger brakes and unique chassis tuning. That quad exhaust is also damn cool. On the outside there's a ton of new aero bits, including a front lip splitter, rear spoiler and side rocker winglets. Three colors are available: Race Red, Deep Impact Blue and Shadow Black. There’s “670” painted on the hockey stick racing stripe along with custom Roush Warrior badging to show off the 'Stang's uniqueness. The interior has “Warrior” stitched to the headrest and there’s a small numbered plaque on the dash as well. Also inside are a 12-speaker Shaker Pro Audio system, HD radio and navigation. There’s no word on pricing yet. But the car is only available through Military AutoSource’s overseas exchange car program. We’re happy that military members get a chance to own such a unique car, but we wonder how many can actually afford this beast. Maybe it’s for officers only? Fox-Only / Special Edition to hit Shelves soon!! 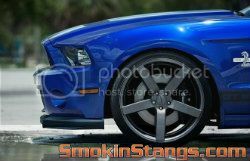 Roush Performance Announces Limited Edition Hyper Series Mustang...One SMOKIN Roush! By SmokinStang in forum Smokin "Chat Room"